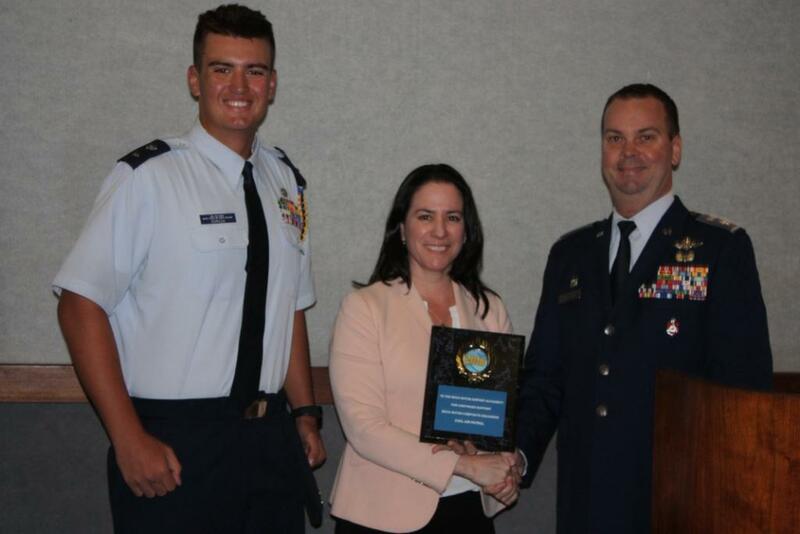 Boca Raton, FL- The Civil Air Patrol (CAP) Boca Raton Composite Squadron presented a plaque to the Boca Raton Airport Authority(BRAA) in appreciation for a generous donation to help pay for leasing space at the Boca Raton Airport. Civil Air Patrol, the official auxiliary of the U.S. Air Force, is a nonprofit organization with 61,000 members nationwide. CAP performs 90 percent of continental U.S. inland search and rescue missions as tasked by the Air Force Rescue Coordination Center and was credited by the AFRCC with saving 158 lives in fiscal year 2018. Its volunteers also perform homeland security, disaster relief and counterdrug missions at the request of federal, state and local agencies. The members play a leading role in aerospace education and serve as mentors to more than 22,000 young people currently participating in CAP cadet programs. CAP has been performing missions for America for 77 years. For more information, visit www.gocivilairpatrol.com.